As your teen gets ready to leave home, one of the questions that your teen will wonder is, "how much do I need to leave home?" Inside LIFE 101 PRO we unpack that question. We have your teen research housing options that are affordable for them, they create meal plans and much more. In that scenario, we tell the teens how much they make per month and they have to make that budget work. However, a great next step is to find out what kind of jobs will make it possible for your teen to make it on their own. A company called Jump Start Financial Literacy has a great tool to help you unpack the next question. 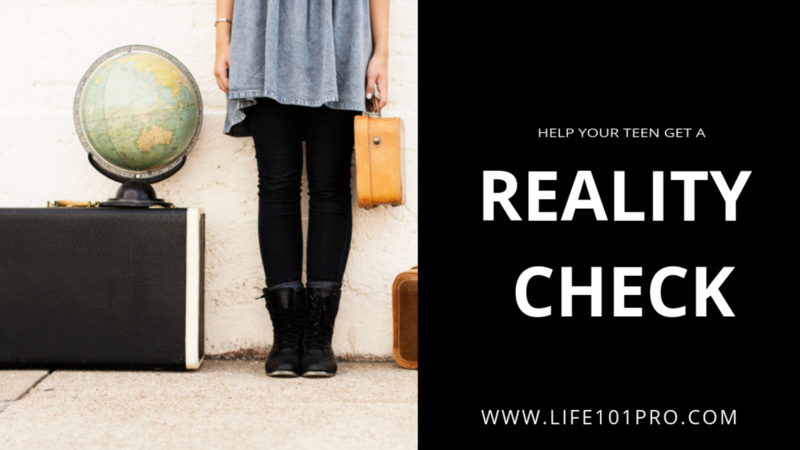 They call it a reality check and I couldn't agree more! The questions take only a few minutes and the answers are GREAT! how much the need to make to live the lifestyle they hope to live. how much education is needed to obtain a job making that kind of money. what kind of jobs offer that kind of pay. It.Is.FANTASTIC! CLICK HERE to try it out. The only thing piece of the puzzle I think that needs to also be considered is location, as that will dictate quite a bit of the cost of living. But it definitely gives a ballpark and I totally recommend it! CALIFORNIA: Reality check for living in California.